Camping popularity is on the rise with all age groups. And glamorous camping, or “Glamping”, is the latest trend in niche campsite offerings. Many campgrounds now offer the option to rent a campsite full of beautiful fabrics, full beds, and interesting accessories. It makes camping feel like a rustic getaway instead of roughing it in the tent. But many of these getaways have a high price tag attached to them. Not only do you pay for all that ambiance, but you often pay a hefty price for the campsite itself. And it may not be as beautiful as the state park down the road from your home. In this article, we’ll show you how to make even the most skeptical camper comfortable with glamping. And it’s not hard to do. 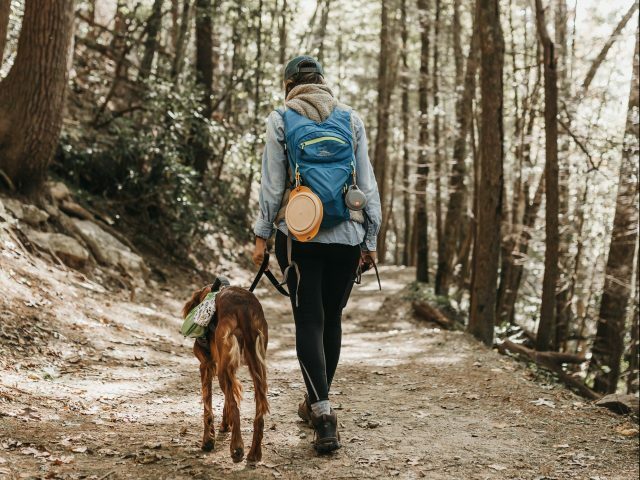 With a few simple changes, you can go from camping to glamping in no time! 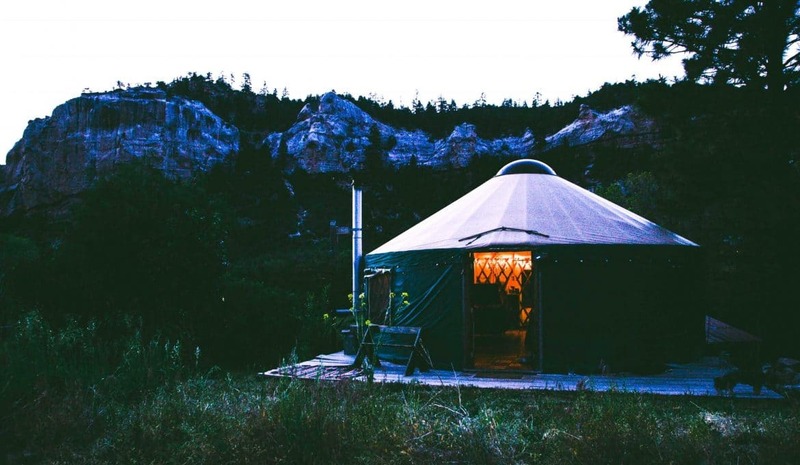 What Is Glamping and Where Can You Do It? When we think of camping in style, we often think of renting a high-end cabin for a weekend. Or camping in a spacious and luxurious RV. And in that sense, glamping has been around for many years. But turning a basic tent campsite into something more glamorous is an idea that’s taken off over the last few years. It’s a great way to “rough it” but still have beautiful things around you to make your stay more comfortable. 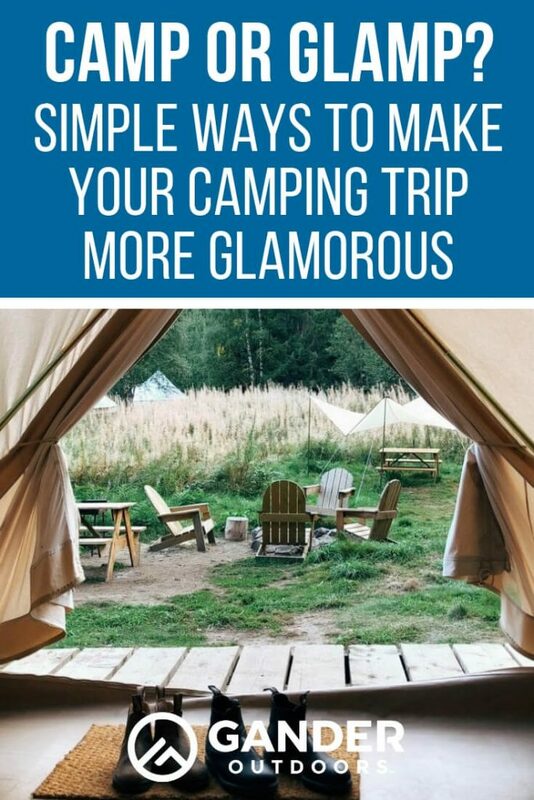 You must remember that glamping means you’ll need to bring more stuff with you. So it’s not an option for someone who’s planning to backpack into their campsite. And basic amenities like water, electric, and a nearby toilet, are a must if you really want to enjoy your glamping experience. The good news is that most state and local parks have all of these services available to their campsites. And they offer some of the best outdoor views you’ll find anywhere. National parks offer a lot of amenities too. But most do not offer electric at all campsites. 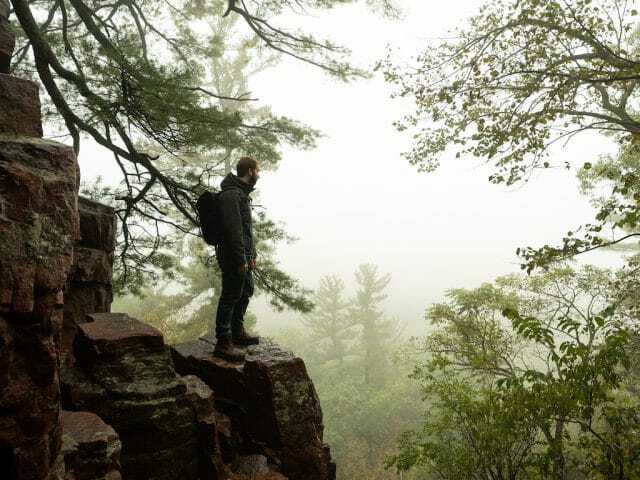 So if electric is a must for you, you’re better off going with a state park or a local campground. Or renting a generator for your stay. 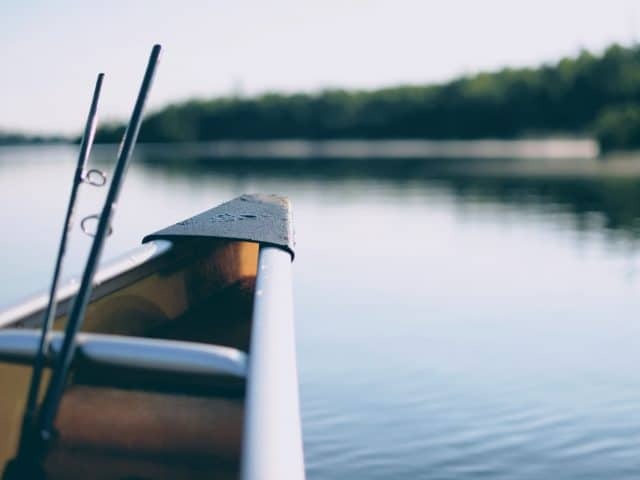 Do your homework and find a beautiful location that offers you the amenities you need without packing you into a campsite like a sardine. RV parks and campgrounds are great, but not if you want a beautiful view outside your tent windows every morning. All of these tips are easy to do and they won’t break your budget. Many of these items are available at your local Gander Outdoors store. Tent technology has come a long way since the early days when tents were leaky, hard to fix, and in general, unreliable. Nowadays, tents come in every shape and size. And don’t worry, you won’t have to take out a loan to buy a tent. Most tents that make suitable glamping tents are between $100-$200. Consider it an investment in the future. Once you get comfortable glamping, you’ll want to do it over and over again! The size of your tent matters. A two-person backpacking tent won’t work if you plan to glam it up. 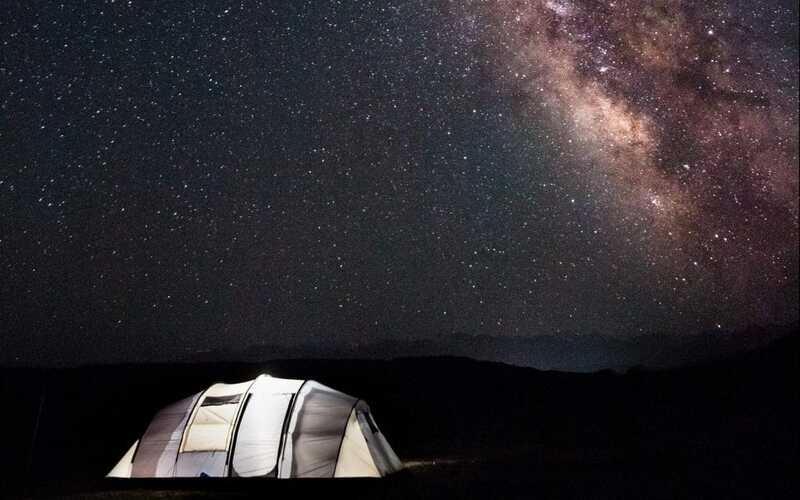 Go with a tent that sleeps more, like six or eight people. And make sure it’s got plenty of headroom all the way around so you can stand up comfortably. Also, consider getting a tent with two rooms. Then you can set up a bedroom and a cozy living room in case it rains. Most campers use an air mattress as their bed and some opt for a sleeping pad, which is a thinner version of an air mattress. Gander offers a ton of mattress and pad options in the sleeping gear section of our website. Buy a lightweight metal bed frame from a local or online retailer. These frames come in the regular bed sizes and fold up so they’re perfect for travel. Put one of these under your air mattress and… tada! You’ve got a bed! Also, they make taller air mattresses that stand up a few feet off the ground. If you want to upgrade your old mattress, consider getting one of these. The point is, it feels more homey and comfy when your bed isn’t laying on the floor. Then splurge a little on bedding. Make your bed like you would at home, with a sheet set and comforter. Bring lots of big comfortable pillows. And some extra blankets to keep warm in case it’s cold at night. Top off your bed with some throw pillows to add to the decor. The floor of your tent is made out of tough tent vinyl. That’s great for keeping water out, but it’s not all that comfortable on your feet. Bring a small area rug to go under the bed that gives you a place to put your feet down while you get your shoes on. Rugs work in other areas too. 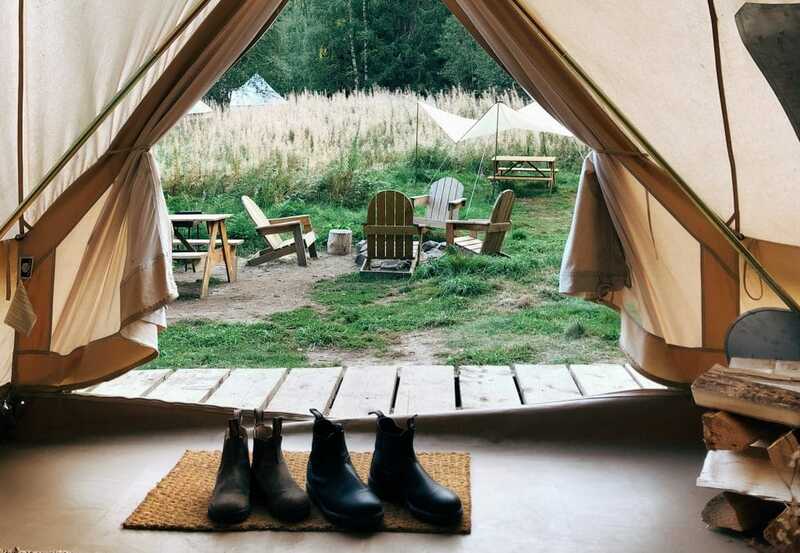 If you have a larger tent, keep a welcome mat inside the door so you have a place to set your muddy shoes. And put another rug, something that’s made to go outside, right outside the tent door. Then you have a place to clean off your shoes before you put them in your tent. Outdoor rugs are common with RV camping. But you don’t need an RV to use one. Gander offers a wide variety of these outdoor rugs. Create an outdoor living space outside your tent with one of these large area rugs. Camping chairs are a must, but consider upgrading them. Throw out those old, worn folding chairs that you’ve been using for 10 years and get something new. There is an endless selection of colors and styles of outdoor tables and chairs available on our website. Many camping tables fold up so they’re easy to bring and store. Add two small side tables to your bed to make it feel more like home. Add a larger camping table outside by your camping chairs to create a conversational sitting area. Most campsites include a picnic table. Jazz it up with a beautiful and water-resistant tablecloth. And add a centerpiece that compliments your glamping theme. 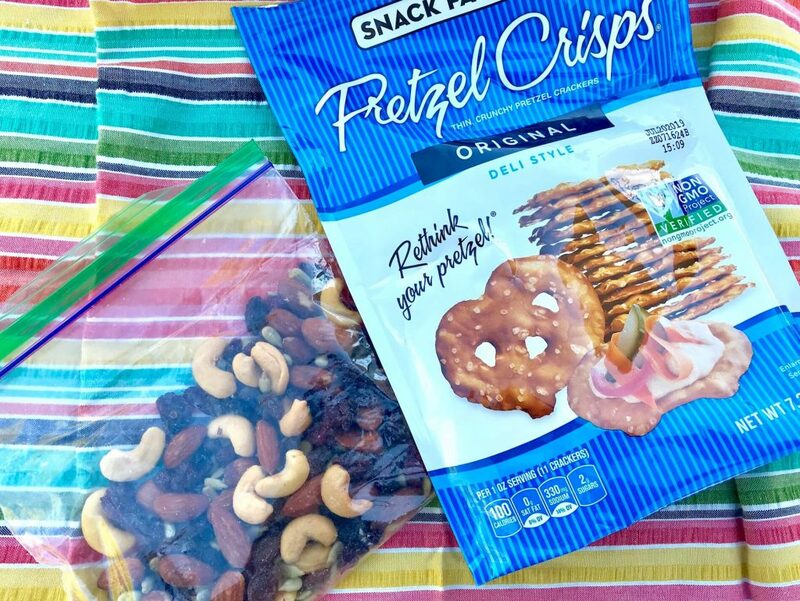 One key to creating a glamorous camping trip is to make the food glamorous too. Bring all of the camp cooking gear you need to create delicious meals. Try out some new recipes with high-end foods like different cheeses, fine wine, and plenty of spices. You can cook almost any recipe either over the fire or on a small, propane camp stove. Test out a few before you go so you know you have the right tools. Don’t forget about serving your meal. Colorful serving bowls are a must. Bring some beautiful plastic plates with real eating utensils. Many retailers sell plastic plates and cups that look like porcelain or glass. They’re easier to haul around and much more beautiful than paper plates and red Solo cups. Use lighting to create an elegant ambiance even when you’re out in the woods. With an electrical hookup, you can bring almost any kind of lighting you want. Without electric, rely on gas or battery-powered lamps, and candles. Add small table lamps to your nightstands to bring warmth into the tent. String up Christmas lights around the tent and outside for a fairy-like glow. Got mosquitos? No problem! Light lots of citronella candles around your campsite. This gives you light and keeps bugs at bay. Two birds, one stone! 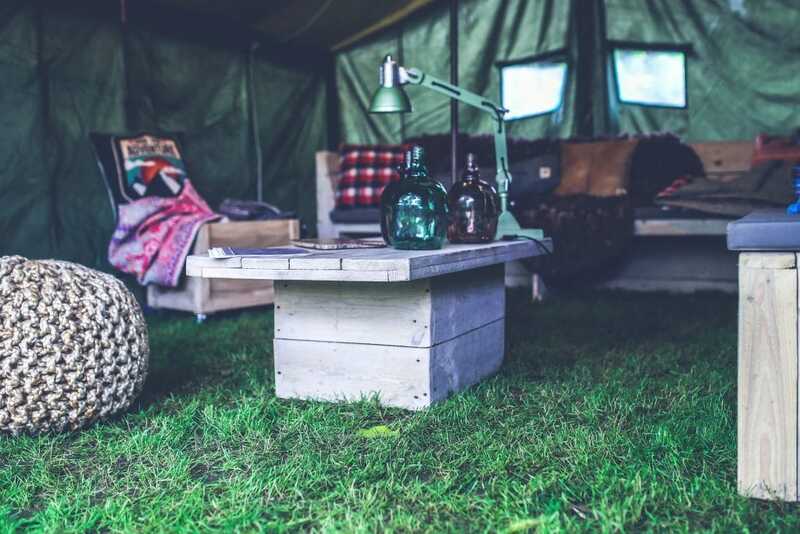 Glamping Isn’t So Hard… Give It a Try! Enjoy a beautiful glamping experience with very little money spent and just a little preparation. You’ll convince even the most skeptical camper to go again. 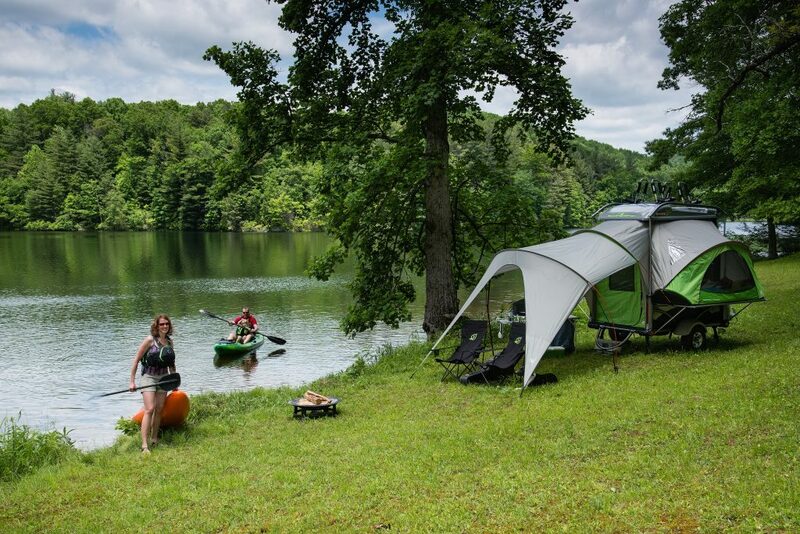 Remember, pick a campsite that’s beautiful, not too crowded, and has the amenities you need for proper comfort. Choose a tent that’s large enough with plenty of headroom. Use an inexpensive, fold-up bed frame to support your air mattress or pad. And bring lots of beautiful bedding, as if you were making a bed at home. Also, try a few area rugs in and around your campsite to add comfort. Use camping furniture to your benefit. Invest in modern folding chairs and some folding camp tables to create different social spaces throughout your site. And try serving a gourmet meal, complete with wine glasses and real plates. Finally, bring light into your site with lamps, string lights, and plenty of citronella candles to send away the bugs. If you follow these simple steps, you’ll want to glamp over and over again! 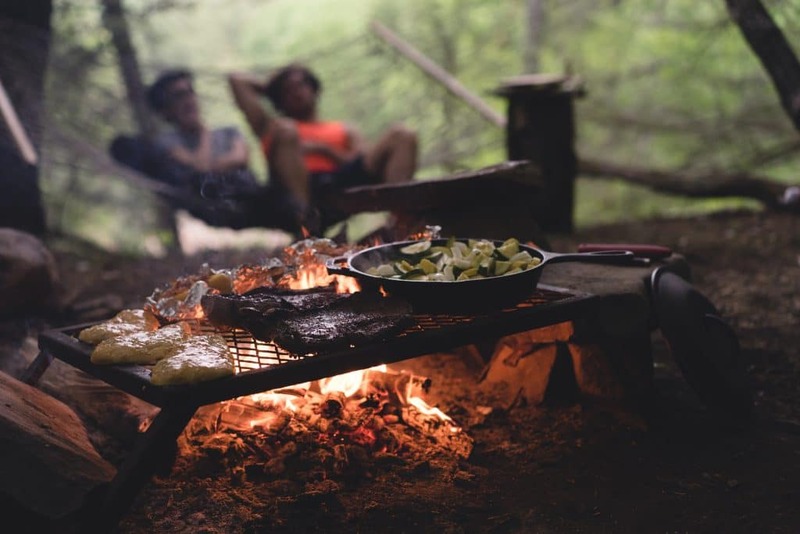 Want to learn more about how to create the perfect campsite? 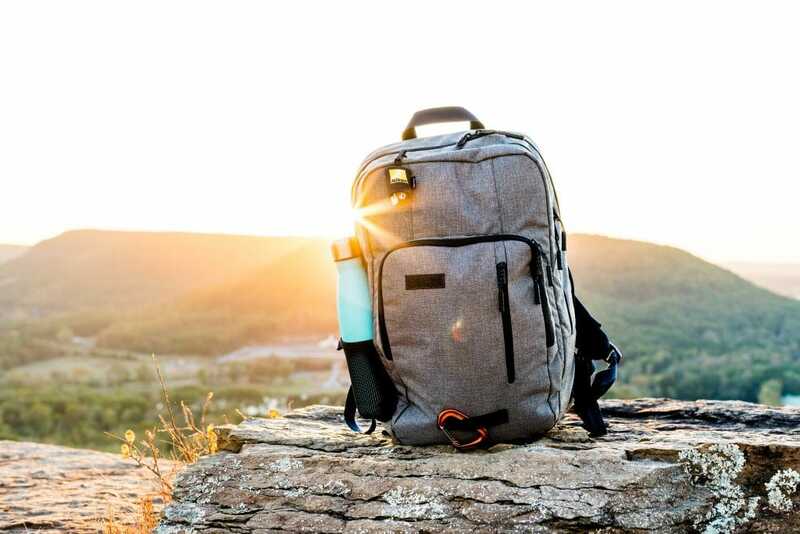 Check out all the camping gear we offer online. Or visit one of our stores to talk to a camping expert!